Keeping track of your moods is a great way to check in with yourself. If you keep track of other things you do that affect emotions—exercise, sleep, medications—you can also discover what helps you feel better and what brings you down. Obviously, you can use a pencil and a sheet of paper to track your moods, but that’s not much fun. The Internet is full of free mood trackers (I reviewed one available at Healthy Place), but I wanted something I could carry around with me, preferably on my iPad. 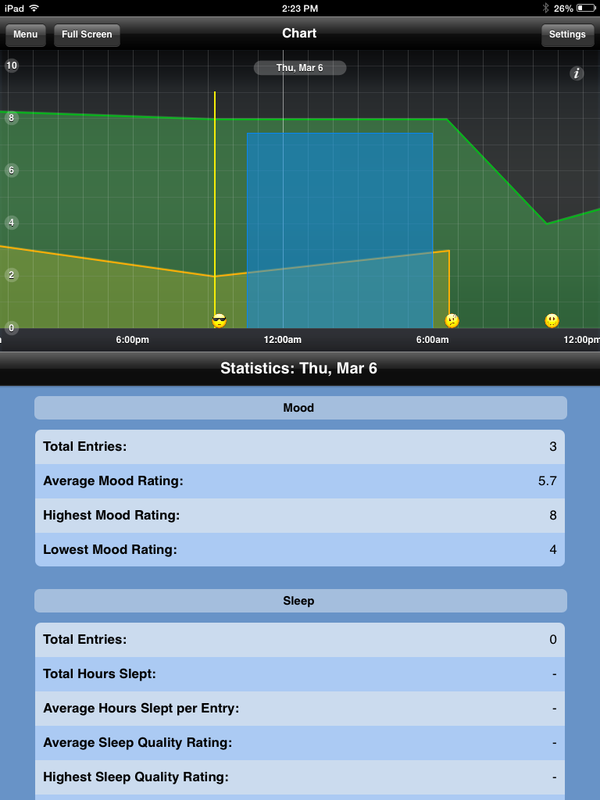 MyMoodTracker for iPad is just what I was looking for to make mood tracking easier, but I had to spend $4.99 to get it. It’s comprehensive, colorful and generally easy to understand. You can track more than just moods. 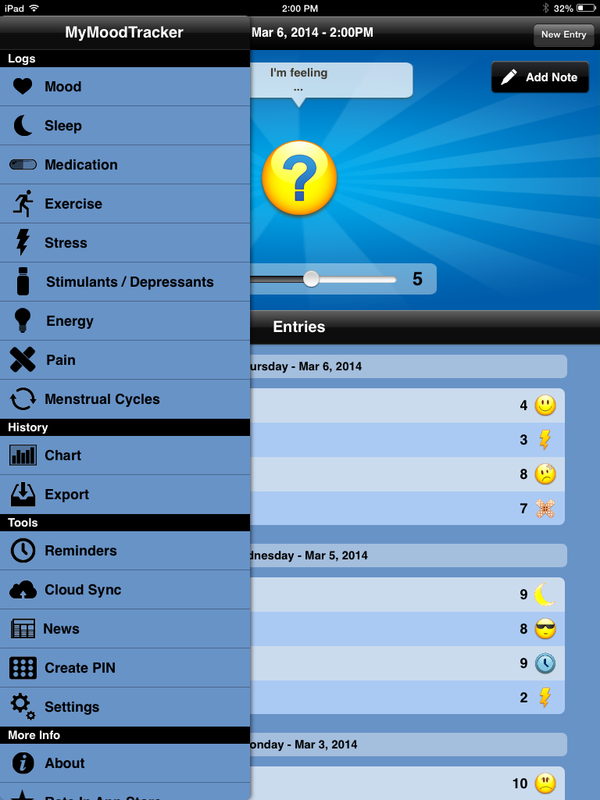 There are logs for mood, sleep, medication, exercise, stress, stimulants/depressants, energy, pain and menstrual cycle. You get to customize each of the logs and set the intensity of each feeling. The mood log offers twenty preset moods depicted by yellow emoticons that are either smiley or not, depending on the mood they represent. You can edit the descriptions to better match how you’re feeling, but you can’t change the emoticons. A question mark emoticon allows you to add a mood, but the question mark remains and appears in your overview for the day you used it. You can change the question mark and the other emoticon descriptions as many times as you like. The mood log and many others, such as the pain log, allow you to set intensity on a 1-10 scale. You don’t have to use all of the logs. I chose to use only mood, sleep, exercise, and stress. I occasionally use energy, especially if I’m in an ok mood but still feel like a slug. After a week or two of tracking, you’ll have enough data to begin to see trends in the chart view. You have to click on the little i button in the upper right corner of the chart for a color key; I missed that until just recently so found viewing the chart pretty frustrating. You can view the chart by day, week, month, or year. Using the week by week view, I was able to see that how much sleep I get has a significant impact on my mood. Too much or two little have a negative impact. I’m now aiming for around seven hours every night, which seems to be the magic number for a pleasant mood the following day. I use MyMoodTracker on my iPad, but the Cloud Sync feature would allow me to share it across all of my devices. Aspyre assures the information is secure, but I’m more comfortable keeping it on my password protected iPad. You can also choose to export data to a spreadsheet. Exports can be customized to export the logs you choose. Using export, you can print a copy of your results, making it easy to share with your healthcare professional. You can keep track of more than just moods. You can vary the intensity of moods and stressors. You can track by day, week, month, or year. Export makes it easy to share data. Cloud Sync puts MyMoodTracker on all of your devices. You have to buy it, though I found it well-worth the $4.99. If you hate smiley faces, you’re out of luck. It can be hard to find helpful information. MyMoodTracker is a crazy good app.